Today you will see some great projects using our December Ribbon Club Assortment from our very talented design team. They always come up with some super ideas. Isn't this assortment great?? It contains 9 styles and a total of 17 yards of ribbon and trim. If you aren't already a ribbon club member, why not join us today! You will get a fun new ribbon assortment shipped automatically each month. At the end of the hop, comment on this post answering the question below for a chance to win our December Ribbon Club assortment shown below. New Year's Resolution? Do you make them? Do you want to share?? How long do you usually hang in there before you give up? Our winner will be selected from the numbered comments on this post on Thursday, 12/17. Be sure to check back on Thursday evening to see if you are our lucky winner. Not much of a resolution maker, that way I don't disappoint myself when I quit. Always strive for better each day. Hopped through all of the DT blogs. Wow, they have shared some amazing inspiration! TY. Great hop! I don't do resolutions. They don't work for me. I try goals, that works for me! The DT did such an inspirational job! Loved all the projects! The ribbon is so pretty. I do not make resolutions. I make goals all through the year. But I must say that I do look forward to each New Year. Great projects on this hop. My New Years resolution is to lose weight... Same one every year! I keep trying all year. I don't bother any more. I know I won't keep them, so I don't ever make them. I don't tend to make resolutions-- but it is a great time to make sure I'm getting back on track with my diet! I don't think I have ever made a New Years resolution. I just live life as it comes and hope for the best. I don't make any New Year's resolutions. I did when I was younger and it was always the same. Lose weight, get in shape. Didn't last too long. Now I just try moderation in eating. Sometimes. Once in a while. Ha Ha! I just try and be good. Thanks for the blog hop. Love the blues and what everyone did with them. Very creative and imaginative. 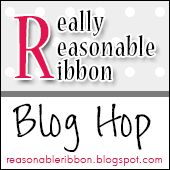 Wonderful projects with these ribbons on the blog hop. I don't formally make New Year's resolutions. I just try to do better in all areas of my life--a new start. New Year's Resolutions - I don't usually make them. Too much pressure, but I do think about things and try to do more of something I want to improve at...like better bow-making! :) Thanks for the hop, great inspiration by the DT!